Grand Hotel Casino runs on software provided by Microgaming systems. This professional online casino offers over 260 games with new titles being added every month. More than half of the games at Grand Hotel Casino are slot games based around different themes – everything from classic reel slots to modern video slots, and even Progressive Jackpot games. 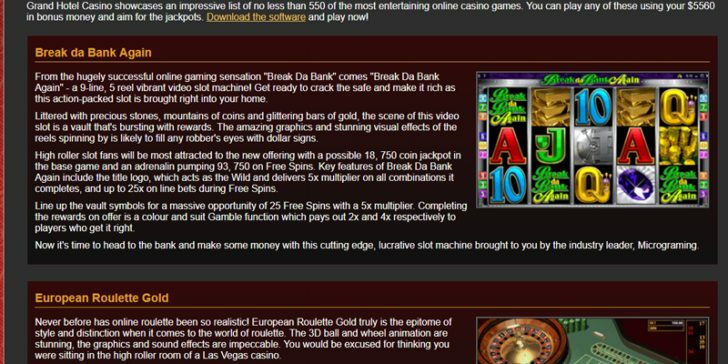 They have an excellent collection of video poker games as well, plus the usual selection of casino classics like blackjack, poker, roulette, craps, and more. Grand Hotel Casino has a creative welcome bonus package which gives away $362 free to all new players. 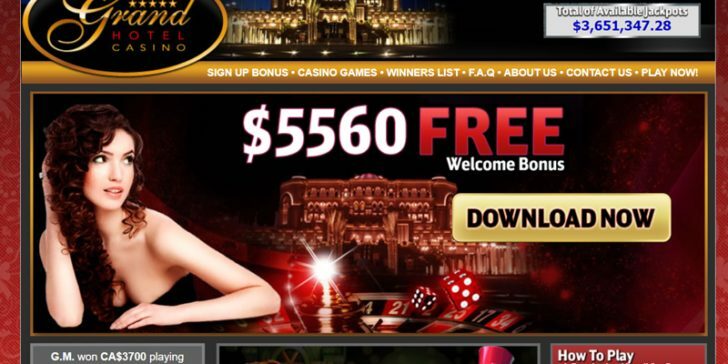 The casino offers a generous 100% bonus on everyone’s first deposit up to $150. With their second deposit players receive an additional 20% bonus up to $100, and then a 50% bonus up to $100 on the third deposit. Loyal players are given VIP treatment through the casino’s Loyalty Program, which offers exciting promos and special offers to regular players.